Delasol Homes: $$$ BRAND NEW ROOF, GUTTERS ($80k) AND NEW AND NEWER AIR CONDITIONERS (ONE IN 2017 OTHER IN 2018) Low HOA fee of $765/qtr. This ESTRELLA SINGLE STORY model features 4+den, 4 baths and 3CAR GARAGE. 3,217 sq ft under air. Spacious living room, formal dining and family rooms have crown moldings. The gourmet kitchen features breakfast bar, morning room, center island, desk area, pantry, SS appliances and GRANITE counter tops. PLANTATION SHUTTERS THROUGHOUT. TRAVERTINE TILE AND WOOD FLOORING THROUGHOUT. MASTER SUITE has his/hers separate closets, separate shower, soaking tub and dual vanities. 2 guestrooms share a full bath plus an additional private entry in-law suite. Overlooking the tranquil lake view is an OVERSIZED LANAI AND CAGE measuring 60'x 30'!!! Hurricane shutters. DELASOL is located in N Naples off of Livingston close to the much anticipated, Seed to Table Oakes Farm Marketplace. Delasol Homes: Were you always dreaming of the large and spacious 4 bedroom and a den home perfectly situated on the over-sized lot on the cul de sac? Well, look no more! This pristine lakefront pool home looks out over the lake with no homes looking back at you. The list of builder upgrades is long: double doors with decorative glass, gourmet kitchen with 42 in. top of the line kitchen cabinets, granite counter-tops, stainless steel appliances and wine cooler, central vacuum, plantation shutters, beautiful tray coffered ceiling and many more! Relax with a glass of wine in your large screened lanai with a hotel like pool and spa enjoying beautiful Florida sunsets. Located in a desirable gated Delasol community, situated on 147 acres with lakes, nature preserves and green areas, where lifestyle embraces tranquility and peace. Enjoy community pool and spa, 3 tennis courts, activity and fitness center and many more. Delasol Homes: BACK ON THE MARKET - BUYERS FINANCING FAILED. A very special Encina Model offering 3021 square feet of air conditioned space. This home has been lavishly upgraded with electric storm shutters on the lanai and front entrance ($40,000) plus 3M film on all windows plus Lucite shutters for all other openings. A lovely free form pool overlooking the lake. Flooring includes large tile on the diagonal throughout the main living areas, cherry hardwood in the den and dining room and carpeting in all bedrooms. The kitchen (a chef's dream) features granite counters plus an island prep sink. The stainless steel refrigerator was installed 2017. The air conditioner and hot water heater were replaced June, 2017. All three bathrooms have granite counter tops. The living room, dining room and breakfast area have additional crown molding. Additionally there are plantation shutters on all windows and doors. Well over $100,000 worth of upgrades have been installed in this home. Delasol is a gated community with a live guard, clubhouse with pool and spa, basketball, pickle ball and tennis courts, playground, exercise room, etc. Located close to the beaches, restaurants and shopping. Delasol Homes: THIS HOME HAS NEVER BEEN LIVED IN. Don't miss the opportunity to purchase this much sought after Encina model home located on a premium lakefront lot in Delasol. A spacious 3030 sq. feet under air. 4 bedrooms plus den with 3 full baths. Western exposure overlooking the lake offers stunning sunsets year round. Coffered ceilings in the great room and architectural details throughout. Located on a quiet Cul-De-Sac street . An oversized garage with extra storage space. The Encina model was the most popular floor plan in the larger homes collection. Delasol has a clubhouse with workout area, the community pool and spa, tennis courts, play area, basketball, sidewalks on both sides of the streets and exercise area. New pickle ball court. This home is light, bright and neutral throughout with large porcelain tile on the diagonal. This is a guard gated subdivision convenient to shopping, minutes to the beach and multiple restaurants. The home has been meticulously maintained. There is one word that best describes this home - IMMACULATE!!!!!!!!! This large premium lot has plenty of room to add a pool or just use the large pool up at the clubhouse. Delasol Homes: Lovingly maintained with many current upgrades. A/C, and hot water heater all only 1 year old. Stainless steel side by side refrigerator is 3 years old. This Encina model offers 3021 square feet under air conditioning. Lovely granite countertops in the kitchen and all 3 bathrooms. Master bedroom has bamboo floors as well as bedroom #3. Ten total fans throughout the property, whole house surge protector, 3M film on all glass surfaces, plantation shutters on all windows. All bedrooms have 4 topper lights. The spacious kitchen has tile backsplash and an island for additional prep space. Under counter lighting throughout the kitchen. Plantation shutters on all bedroom windows plus the den and dining room. On the lanai there is a manual shutter on the right hand wall. This owner also had an electric shutter installed to protect the front door and large arched window at the front of the home ($6,000). UPGRADES GALORE. Lovely long lake views. Delasol is a gated community with a live guard. Clubhouse, tennis, pickle ball, playground, exercise room, large pool and spa, and basketball. Sidewalks on both sides of the streets for that morning walk with your pet. Delasol Homes: Welcome to Delasol, a highly desirable guard-gated north Naples community. This beautifully maintained “Verano” model home faces west and offers 3 bedrooms, a den (easily a 4th bedroom), 3 full baths, formal dining area and a 3 car garage! An arched foyer invites you into the sunny great room with diagonally laid tile floors. A wall of glass sliders opens onto the screened lanai with irrigated planters and a custom oversized heated pool and spa. Enjoy entertaining in the large open kitchen, which features upgraded cabinets, luxury granite counters and a designer tile backsplash. The stainless steel French door refrigerator and dishwasher are almost new and a brand new microwave and oven were just installed. The den and master bedroom suite have beautiful wood flooring and the master bath offers dual vanities plus a tub and step-in shower. Community amenities include a clubhouse/social room, fitness studio, tennis, pool and more. Delasol is conveniently located close to everything and zoned for A-rated schools. Delasol Homes: H.14380 - IMMACULATE & most popular VERANO floor plan in highly desired North Naples gated community, Delasol, celebrated for its open concept & efficient use of space boasting 3 Bedrooms+Den, 3 Full Baths, 3 CAR GARAGE. SMART HOME automation controls lighting, entertainment & other connected devices! Wifi enabled dimmer switches, Cat6, NEW 21 SEER A/C, newly painted inside & out. SALTWATER POOL, "rock waterfall" feature, screened lanai, new high end LG Stainless appliances & washer/dryer, top of the line 42 in. wood cabinets, plantation shutters, recessed led lighting, expansive volume ceilings, tile throughout living areas, all NEW carpet in bedrooms. Delasol is a popular low density private gated community w/sidewalks on both sides of the street, only 271 single family homes on 147 acres, 62 of which are set aside for preserves, lakes & green spaces. Enjoy the renovated clubhouse, heated pool, spa, lighted tennis courts, updated fitness center, basketball & play areas. Situated off Livingston corridor, close to great schools, parks, shops & restaurants. Just 3 miles to world class Naples beaches, near shops, restaurants & highly anticipated Oakes Farms Market, opening soon. Delasol Homes: This brightly lit 2-story home with 2,498 sq. ft. of interior living space includes a first floor master bedroom, great room, 3 additional bedrooms and 2.5 baths. Upstairs an open loft area providing the kids a play room or teenage hang out. Recent upgrades include the downstairs flooring, kitchen cabinets and bathrooms. Enjoy your large living room that opens up to an oversized pool, paved lanai with covered living space and a fenced dog run. Meticulously cared for with a WHOLE home generator, Reverse Osmosis in kitchen, plantation shuttters throughout, crown molding, picture windows, and volume ceilings. Exterior home upgrades include beautiful stone accent, front screen porch and a new paved walkway. Delasol is a guard gated community offering newly renovated amenities-including clubhouse, fitness center, 3 tennis courts, basketball, playground and amazing community pool & spa. Delasol is unique for having 147 acres of nature preserves and lakes throughout the community, creating privacy with the ability to enjoy the serenity of nature. Coveted A-rated school district in North Naples. Delasol Homes: Beautiful three-bedroom, two-bathroom cul-de-sac home with two-car garage in the sought-after neighborhood of Delasol, North Naples. This light and bright home with an open living-dining floor plan has both tile and wood flooring. With stainless steel kitchen appliances, designer light fixtures, and plantation shutters, no details have been ignored. The totally renovated screened lanai includes a newly installed pool and waterfall feature. With new pavers and overlooking the recently landscaped backyard, this outdoor living area is the perfect extension for entertaining or relaxing. The popular North Naples community of Delasol boasts a clubhouse, community pool, spa, tennis courts, basketball courts, children’s play area, nature preserve, and has a 24-hour manned front gate. This favored community is near to the best beaches, dining, and shopping in Naples. Delasol Homes: ?Spring special! This large and lovely 5 bedroom, 2 1/2 bath pool home is priced to sell… so much house and priced to sell! Spacious rooms with generous closets and storage throughout. Many upgrades including stainless steel appliances, tile, wood flooring, new AC in August 2018, upgrades galore. Neutral and tasteful Decour just move right in and enjoy! Relax poolside in privacy with peaceful preserve views. Delasol is a guard gated active, pet friendly community with prime north Naples location centrally located at Immokalee/Livingston… West of 75 so you avoid the congestion and easily get to all shopping, dining, white sand beaches and outstanding schools. Cul-de-sac location with in the community makes this home a safe choice and a best bet! Delasol Homes: LOOK WHAT YOU GET FOR THIS PRICE!! LOWEST PRICED 4+Den/5 BD HOME WITH A POOL IN DELASOL!!! A beautifully appointed 5 Bedroom, 2.5 bath two story home with pool loaded with upgrades! This Cielo floor plan features Travertine marble floors, inlaid wood floors, crown molding, tray ceilings, and expansive 2 story ceilings in the great room. The kitchen features granite counter tops, tile back splash, stainless appliances, and eat-in area. Spacious screened lanai with solar heated pool, water fall, and paver brick decking, even cable pre-wired for the TV on the porch! Situated on a private corner lot with an abundant driveway. Great opportunity to own in a premier, centrally located, Naples community with close proximity to Wiggins Pass State Recreational Park, Vanderbilt Beach, Mercato, the C'Mon Children's Museum, the Water Park, and a wide variety of fantastic dining options! Easy access to I-75 for those quick trips to the RSW Airport, Everblades Hockey, or Gulf Coast Town Center! Delasol Homes: Amazing opportunity for one of the most updated 2 story homes in Delasol with 4 bedrooms, 2½ baths and an open airy loft. Even the most discriminating buyer will realize it is simply the best. Some of the features of this home are white kitchen cabinets with crown, new quartz in the kitchen with granite farmhouse sink, newer Samsung black stainless appliances, independent center island with matching quartz, beautiful tile backslash, new LED recessed lighting, freshly painted inside and out and brand new carpet! You will appreciate the accent of the brick mantle in the great room as well as the inspiring view of the Zen area outside your lanai. The wrought iron staircase takes you upstairs to an extended extra-large bedroom and another guest bedroom as well as the open loft to relax in. These are just a few of the upgrades, there are too many to list. Delasol is a guard gated community close in with only 287 single family homes featuring a clubhouse with gathering room, pool and spa, fitness center, tennis courts, sidewalks on both sides of the streets and great schools nearby. It doesn't get any better than this, call me, this is one you need to see. Delasol Homes: PRIME LOCATION -- "A" rated schools--N. Naples Middle School & Gulf Coast High!! This fully furnished single family home in the gated N.Naples community of Delasol has so much to offer. Light, bright and open, with FOUR BRs -- a first floor master suite +3 additional spacious bedrooms! There is also a loft/bonus space; this home is IT if you love to entertain! As you enter the foyer into the large great room which is open to the kitchen and lanai, you will surely be impressed. Unique in so many ways -- volume ceilings,a loft overlooking the great room, a private backyard, & the most lovely pool/lanai area! Excellent location within the community, close to QUIET cul-de-sac. Spend lazy days on the lanai with your favorite book or evening cocktail. Wait! There is more -- plenty of space for a home office/hobby room. The large 2 car attached garage is the perfect place to keep your kayaks, bikes, & FL toys! Delasol amenities include tennis, swimming, fitness, community social room & more. Just minutes to the upscale Mercato shops, downtown Naples, award winning beaches & the SWFL Intl Airport. The perfect home in the PERFECT community! Call today as this home has it ALL! Delasol Homes: CHECK OUT THE 3D TOUR IN THE VIRTUAL TOUR LINKS ABOVE! Spacious home in Delasol with an open staircase to the second floor from the spacious 23 ft living room. The large kitchen features an open concept with a breakfast room, and pantry. The master bedroom is on the first floor with 2 walk-in closets, spacious master bathroom, neighboring the den or guest room with a half bath. The 3 remaining bedrooms are on the 2nd floor with a full bath. The residence also has a laundry room indoors leading to the two car garage and a screened lanai at the back of the property. Delasol has numerous amenities available for residents to enjoy. Residents will enjoy a pool as one of the top luxurious amenities. Enjoy a private clubhouse available to all residents of the community, as well as a resort-style pool with spa, 4 tennis courts, and a small children's playground and basketball area. Location is located just north of Immokalee of of Livingston road which provides access to grocery stores, restaurants and Naples' Award-Winning Beaches. Delasol Homes: Amazing Views with many upgrades, This gorgeously maintained home in Delasol has it all. Inviting/Open floor plan with extensive upgrades including oversize pool lanai, 8' doors, upgraded trim & moldings. Tile throughout Great Room, Dining, Kitchen, Dinette and Entry. 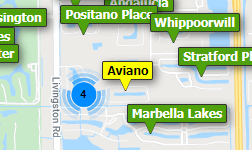 Close to all the "A" Rated Schools in the District, and fantastic Delasol amenities with superb North Naples location right off Livingston Road. Just minutes to the Beaches & Wiggins Pass Park, RSW airport and world class shopping! The much anticipated, Seed to Table Oakes Farm Marketplace is practically across the street. Low HOA fee of $750/qtr. make this one of the best values in Naples. Call today for more details! Delasol Homes: BEST BUY IN DELASOL - PRICED TO SELL ! This OPEN FLOOR PLAN, POOL Home has wonderful features including LOVELY 10' to 12' ceiling heights, extensive tile in living area, Custom wood cabinets and granite. A very spacious Master bedroom with oversize soaking tub & walk-in shower, kitchen pantry, separate laundry with sink, custom Oak shelving, and 8" doors. Open, airy rooms offer a pleasant spacious feeling with West/sunset exposure. Outstanding location in north Naples! Great schools ! Great neighborhood ! Great Price ! Delasol Homes: This home is easily the best value in Delasol. 3/2 Lake View There is over $40k in upgrades, not counting the plantation shutters or lighting. 18" diagonally laid tile is everywhere except the bedrooms. The kitchen features tumbled marble back splashes, upgraded wood cabinets. The plumbing fixtures, and baths have also been upgraded when built. All of this and within minutes of the beach, shopping, and restaurants...located in a guard-gated, family friendly community. Need professional assistance selling your property at Delasol Naples? Find out how an Area Specialist can help to generate more property exposure in order to get the most money for your investment in the least amount of time.